Do your outdoors become too cold for comfort once the sun sets? Can’t enjoy stargazing or simply sitting outside closer to nature because the cold seeps into your bones? Installing a fireplace or a fire pit should help you stay outdoors for longer. Here are some unusual but strategic spots for a fire pit. Firepits are usually constructed above ground in a circular shape. However, as a fire pit tends to be customized according to the space, location, and need of the owner, it can actually be placed anywhere. This means it can even be built into the top of a table under a covered patio. If you have a fairly large outdoor open area, putting your fire pit in the center is the best way to spread the heat equally. You can also have a built-in seating area to complement your fire pit. 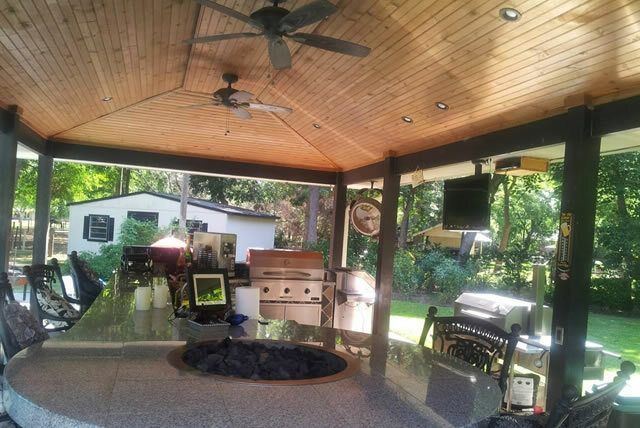 Having your fire pit in the corner can also work especially if it has walls on each sides blocking the wind and reflecting the warmth all over the patio. This placement also works best if you don’t have a lot of space to spare. Where you put your fire pit matters greatly in whether it’ll be able to provide enough warmth to cover the whole expanse of our patio. If you still have doubts on where to install one, call us today for a no-cost, no-obligation consultation!